Composting; How to Make Compost; piles, using compost bins and composters. It's not often you can call something a dirty old rotten pile of garbage... and fall in love with it. That's compost, sweet, beautiful, home-made black gold. Composting is where organic gardening comes full circle. Involving yourself and learning how to make compost is an integral part of truly healthy organic gardening. You've nurtured your plants and eaten your vegetables... and now the kitchen and garden leftovers can be recycled into compost. Making compost is closing the loop of nature... brilliant! This is so simple and so obvious a thing to do, I'm still staggered that people bundle their kitchen and garden plant refuse into plastic bags and send it off to the tip. 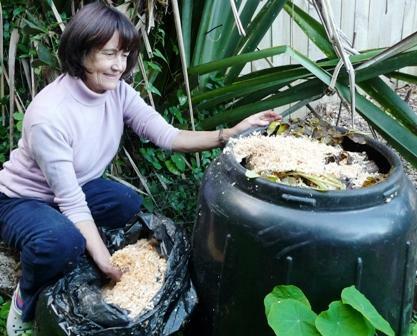 Read here how to make compost and recycle it into something useful. Successful composting is like cooking... if you add X to Y under Z conditions, this MUST happen. If you're just a beginner to making compost, the word 'successful' can have a few different meanings! You might follow all the rules for how to make compost, but no two composts are alike, because conditions and materials differ... so results differ too. Take heart, everything organic, that is, anything that has grown (flora and fauna) or put together from grown stuff (shoes, blankets, apple pies etc) will eventually rot. What you want to do is really is control and fast track the process... bossy you! If you stuff up the process, don't fire yourself, because compost will happen eventually. Remember that. 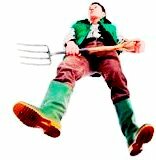 If your pile of would-be compost is cold, lifeless, stinking, sulking... wait, remember... compost happens. You can just pile up your compost materials on a flat bit of ground, preferably with a nearby space to work in, especially if you want to turn your compost over. Handypersons can build a one, two or three set of bins. Or you can use a composter, such as compost bin, tumbler, container, drum or any of the inbetween composting contraptions and compost turning devices available. Have a look at Composters here to be spoilt for choice and read valuable reviews so you can work out what is the most suitable for your needs. 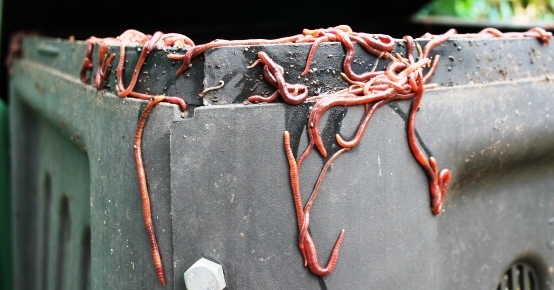 Start your compost pile or put your composter on soil so that worms and other beneficial bugs can find their way in. Put a layer, about a hand deep, of dried or small twiggy material on the bottom. This is classed as carbon, commonly referred to as 'brown' material for the compost. Brown materials are straw, old leaves, newspaper, sawdust... anything that's dead or dried. Now put a nitrogen layer, commonly referred to as 'green' compost material. Use kitchen scraps, grass, fresh leaves, weeds, flowers... anything that's wet and alive. Nitrogen layers should be less than a finger length deep. Keep alternating brown (carbon) and green (nitrogen) layers, roughly having the browns 3 times as deep as the greens. If you have more greens such as lots of kitchen scraps, it's okay to toss them in, but your compost will take longer to make. When green is brown and brown is green, what? Well, brown colored alfalfa and manure are still full of nitrogen, so they're green. As greens dry, such as green leaves, they turn brown and their nitrogen level drops, so they become browns. If you are short of browns, some easy ideas to add are: crumpled up newspaper, torn up cartons or dried leaves which you've stopped by a park and filled up a sackful. Sprinkling over a handful of garden lime every few layers usually helps, but not essential. Add enough water if necessary, especially on the brown layers, so that you keep the whole compost slightly damp, but not soggy. Add compost activators whenever you can between layers, and definitely to finish off near the top of your compost. Natural compost activators will speed up the decay process. Good activators to use are: Comfrey leaves (helps to chop them up with spade first); a spadeful or two of previous compost or even good garden soil; chopped up seaweed; organic fertiliser; manures from herbivores; urine; and compost tea. The final layer should be spread over the top and right to the sides. It should be carbon/'brown' material, or a compost activator such as previous compost or good soil. This keeps flies and smells at bay. Here I am adding sawdust to the top of my compost bin. The bags of organic sawdust are free for the taking from a local furniture maker. More tips on how to make compost using heat. 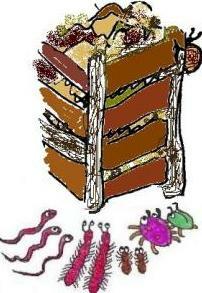 Loosely cover your compost to help trap the heat, stop too much rain getting in and to deter vermin. Air must still be allowed in either through holes in side or around top cover. 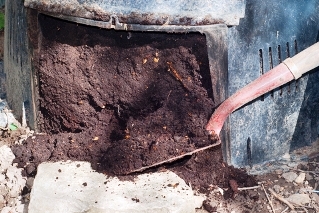 In cold areas, try and site your compost in a sunny position. Conversely in really hot areas, use a shady place as your compost can get too darn hot for too long in searing temperatures. This kills everything including beneficial organisms, and can even combust if the pile is large and dry enough. 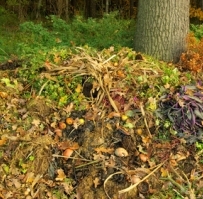 Ideally you should completely fill up your compost pile or bin in one go, then leave it to heat. Hot composting doesn't work if you start small and continually feed it. The material being broken down never gets to generate enough heat, so your compost will take a long time to rot — sometimes 1-2 years. When making compost the hot way it needs to be at least 1 metre high to be able to start stewing to start the decomposing process. 'Cooking' and cooling usually takes 6-8 weeks by this method. Start a second pile while this one is evolving if you can. By continuing to alternate between the two piles, you will have a continuous supply of fresh garden compost for your no dig garden beds while recycling your kitchen refuse. 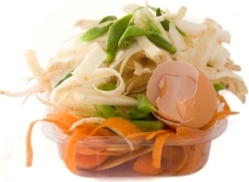 Does compost need to be turned? Making compost in bins with plenty of air holes, means you don't HAVE to turn your compost, and some people will swear that's how to make compost — neat 'n tidy, no fuss, no turning. In the cold hard light of day — and in a cold place — compost really needs turning. Why? Firstly, if the inside has lots of micro-organisms being busy and creating heat, then you need to turn the outsides inside to get the same treatment. You know, sides-to-middle as it was called, like our thrifty forebears used to mend worn bedsheets. Secondly, compost needs AIR to work. Turn the pile. If there isn't enough air circulating, the heat from good microbes (aerobic — needing air) will not build up and the lack of oxygen will encourage the sort of bacteria that thrive in oxygen-poor conditions (anaerobic). Powerful odorous gasses will arise as these bacteria slowly rot the organic materials. If you are really dedicated, turn your compost every few days and you'll have compost in a couple of weeks! If you don't let air get in, then you'll still get 'compost happens', but it might go through various slimy, smelly stages and the flies will die from happiness. 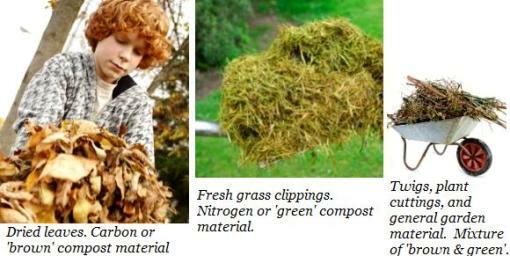 Materials to compost — What to put in compost. The whole shebang is ready when the pile of composting material has shrunk to between 30% and 50% of its original size. It will be dark and crumbly with an earthy smell. Composting is over and your compost soil is ready to use on the garden. The original materials have decomposed releasing their nutrients back into the soil for current plants to use. Thus compost can be used as a slow release fertilizer, plus a soil conditioner in that it adds bulk to sandy soils and helps break up clay soils... black gold.